The Safco Mobile Roll is constructed of sturdy wood-core and has an attractive textured putty-colored vinyl laminate finish. Included 2" swivel caster wheels for easy mobility. 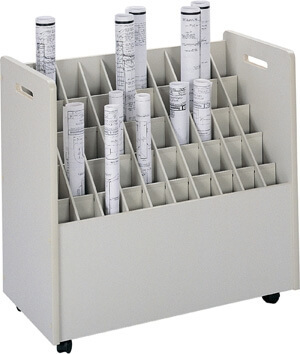 Mobile Roll File has grandstand design (back is taller than front) with square tubes for easy removal of contents. Unit features fifty square tubes to handle large volume needs. Set up is quick and easy with easy-to-follow assembly instructions. Tube size: 50 compartments and each are 2-3/4" square.